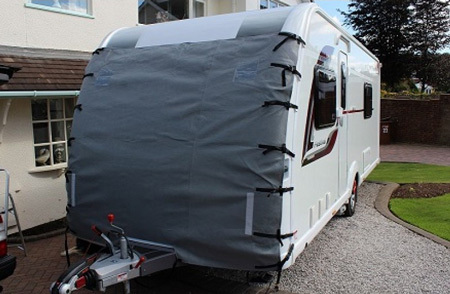 Ever wondered why some owners add a cover to the front of their caravan before venturing out on the roads? It might look a bit strange, but it’s a proven, effective way of adding a layer of protection to your pride and joy. Interestingly, it wasn’t until a major caravan manufacturer introduced a new bodywork construction that the concept of a towing cover was first mooted. The story goes, Protec – already established as the leading exponent of covers for caravans kept in storage – was approached to apply its technology to a cover that could offer protection whilst on the move. That was some seven years ago. More recently, we’ve seen ever curvier profiles to new caravans that have meant moving on from a generic, one-cover-fits-all, to tailored designs. So, what does a towing cover do? It’s an effective barrier to the dead insects, mud splashes, stone chips, general road muck and grime, even water damage, which the front of any caravan is prone to when it’s being towed. Even fumes coming from your towcar’s exhaust can mark your caravan’s glistening white bodywork. And powerful sun can also have a damaging effect on your caravan. 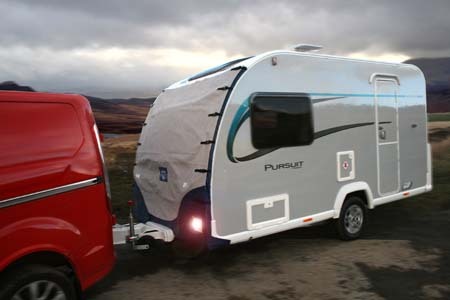 One other aspect – a towing cover can cut out any glare caused by bright lights reflecting off the caravan’s front windows and/or bodywork – including the glare off a rear foglight. Look on it as an added layer of protection. A good quality towing cover will prevent all manner of minor damage to bodywork and windows. So, never mind a clean getaway, these items are about making a clean arrival. It’s also true to say more and more owners are discovering the benefits of such covers – you can see the evidence for yourself on towed caravans on our roads – as well as the particularly immaculate fronts when they’re parked up on site! Although not necessarily illegal, make sure any road lights aren’t obstructed by a cover. Likewise, if you get the right cover it will also allow reflectors to still be seen. Packing away is easy. Covers are really just like large, waterproof sheets. A quick shake should be enough to get rid of any excess water, then they can easily be folded up and tucked away. Get an interior lining that won’t soak up water. You might also want to consider the suggestion from Protec, that the underside of the cover should be white, to avoid the risk of transferring any colour from the fabric to the bodywork. Remember, these are designed for towing and are not to give protection when your caravan is stationary, e.g. in storage. You cover should be clean before you add a towing cover. 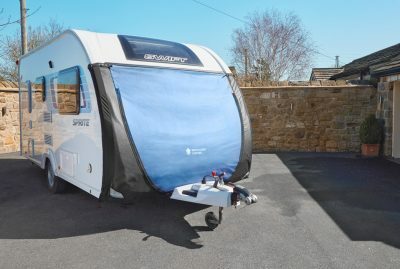 That’s because any bits of grit, no matter how tiny, can have an abrasive effect as the cover moves during any journey – which could cause scratching to appear on the caravan. Don’t forget, also, other covers are available for specialist items, such as bikes, that you might want to cover up whilst towing. A one-size fits all budget product that comes with its own storage bag plus an adjustable strap for tightening it all up when packing away. As well as four reflective strips, this cover comes with twin LED lights, powered by three AAA batteries (which you’ll have to supply). As well as eight straps each side, there are straps to fit around the A-frame and Velcro strips to compete the fitting. Protec uses its own three-layer Protex03 fabric, which promises to be non-abrasive, waterproof and breathable, and promises no raw edges. Options include a waterless, biodegradable cover cleaner, at £11.99 for a 500ml bottle plus two microfibre cloths. However, in most cases simply washing off any dirt with warm water is sufficiently effective. Thanks to Protec, we have one of their caravan covers to giveaway to one of our lucky readers. Click on the link at the bottom of the article for your chance to win. Made using Specialised Covers’ innovative and best selling Stormshield fabric which is strong, waterproof, durable and breathable, Tow Pro covers are one of the most popular range of covers on the market. Featuring zip-fitting elasticised side panels, resulting in a snug fit, the Tow Pros are easy to fit and can easily be put on and taken off by just one person. The Tow Pro comes in four different varieties – the Tow Pro Lite, Tow Pro, Tow Pro+ and the Tow Pro Elite – with prices starting from £179. The Tow Pro, Tow Pro+ and Tow Pro Elite are available for all 2012 caravans onwards and are tailored for each make and model. 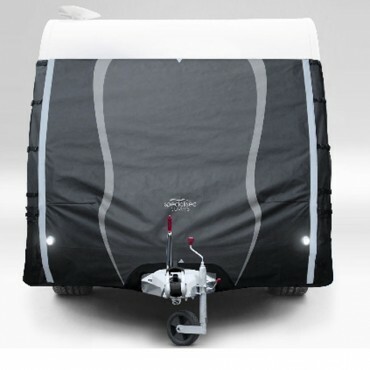 The Tow Pro Lite version offers a universal option for caravans prior 2012 with two awning channels and no wider that 2.5m. The customisable models allow for front locker access, zipped window access, and come in a choice of colours. Specialised Covers have more than 35 year’s experience in the industry and are the official suppliers for Swift, Bailey, and Lunar. Got any advice on choosing or using a towing cover to pass on to others? Feel free to add your comments below. And don’t forget to enter our free prize draw to be in with a chance of winning a FREE Protec towing cover. Simply click on the button below and complete the entry form before June 20th, 2016. Winners to be chosen at random and notified by email or phone. Winner to confirm make, year and model of caravan. Unfortunately, towing covers are not available for Hobby, Eriba, Fendt or Adria model caravans. Caravan Guard cannot take responsibility for the supply and fitting of the towing cover. Closing date for entries: 11.59pm June 20th, 2016. This advertisement is a bit outdated when was the last time you updated it? It’s not an advertisement John it’s a gear guide. It was written in May 2016. Very useful comments and article. Hello dimmelow yes there is a towing cover that fits in the awning rail and the other side is secured with suction cups which work fine. If you are interested i have one which has been on a unicorn and the van is going next weekend. 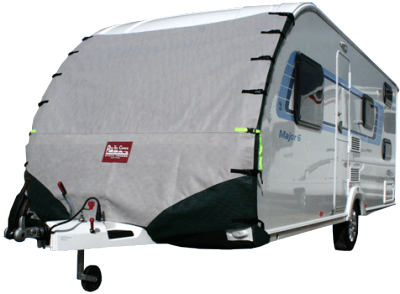 HAVE GOT BAILEY UNICORN MADRID YEAR 2011 WHICH ONLY HAS AWNING RAIL ON ONE SIDE,IS THEIR A COVER TO COMPENSATE THIS PROBLEM?. I bought my first towing cover last year (a tow pro+) but the first time I put it on, the stitching started pulling holes in the elastic material. In no time this started ripping and fraying. I contacted Specialized Covers by email and included photos but never received a reply. I tried again then gave up. 1. Use a different manufacturer! 2. Keep away from the ‘custom’ versions that use elastic to tension the cover instead of straps. 3. Keep emailing and phoning if there’s a problem-it seems making yourself a nuisance is the only way to get attention. “I’m happy to be able to tell you that my tow cover has now been repaired by Specialised Covers following your help in contacting them on my behalf. They duly contacted me and made arrangements for it to be picked up at my convenience. A couple of weeks later, they informed me that it was being despatched on a next day service. Really excellent response from them but also a big thank you to you as I had given up! Thanks Sarah. Sorry about the problems with the form – it’s working now. Interesting article – but when I came to enter the competition to WIN a towing cover, the link wouldn’t work! So less than impressed by that! Thanks for your comments Lindy. We’ve fixed the link now and it’s working if you want to try again. Good luck!